I only briefly glanced through your article OP. So it's possible I missed it and apologize if it did! I think you forgot to mention or weren't aware of the two new followers exclusively for Mage or Paladin. I just happened to have him jn front of my mission board a few weeks ago. Mundane janitorial work he has for you and a cool little 5 second cutscene. Finally the Paladin. My brother got jealous of his Mage brother with a goblin follower so he went in search of additional unique class followers and found this. I think you also forgot to mention that these missions can proc again if you reduce their duration with 5, 10 or 15% items or use followers which have the 20% reduction passive. They re-proc within an hour or 2 provided the tower is still up by then. I rather keep the DK's instant WQ finisher instead of the abomination. Too OP, besides, Dk's already have another powefull tier 2 Troop that can counter bosses thru one of the specializations. Very nice article, thank you very much! However you forgot to mention one item mages can get Patte de lapin porte-bonheur. It requires a certain follower (The Great Akazamzarak). Also, might be worth mentioning that there is no way to use those consumables that increase success chance in the App (or at least I've never been able to see a way). The real question is how are Druids supposed to optimize their champions at a rate even remotely close to other classes who actually get armaments and equipment even insta WQ for ez resources. Compared to my hunter, priest, warrior and mage, druid is months behind yet its my nr 3. None's been able to answer, other than missions. Or some nonsense about the soil spots. 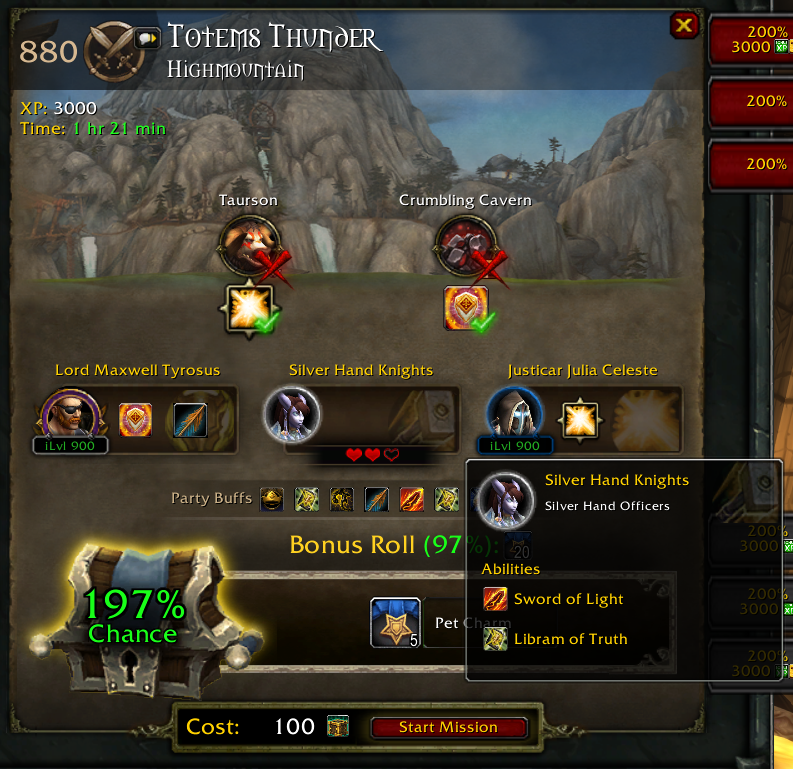 I guess because there is no answer, Blizz like this sort of inconsistency. It appears that once you start two of the Elite Strike missions, the third's duration increases to 12 days. Presumably this is an attempt on Blizzard's part to force us to prioritize which rewards we get, as the way things have been going, the command center will be destroyed, rebuilt, and destroyed again by the time your followers return from a 12-day mission. I believe there's a slight misconception here. Some troops offer bonus success chance against certain threats/bosses, and others counter it. For example, Abominations and Ebon Knight Frostreavers are listed as +30% success chance, plus an extra +15% against a non-boss threat, making them seem the same, when they're not. Countering a threat is often a bigger deal than just success chance. Getting to counter a Disorienting or a Slowing may drastically improve mission efficiency (although the success bonus will only be 30%). And while the guide aims to improve the chances of succeeding, rather than time/resource investments, if your Frostreavers counter a Powerful threat, their success chance skyrockets (roughly 65%) and surpasses that of Abominations. On the other hand, countering a Lethal is not even remotely as useful, and you may be better off with Abomination's 45% over Frostreaver's 30% (Troops are just Order Resources, after all). Lastly, Elite Missions never have Cursed, but for regular missions, not countering it negates any success chance, making Frostreavers able to provide an even greater success rate by removing the 100% cap. Note that this applies to all classes and their respective troop types. Does anyone know why the missions cost different amounts of resources? One of my alts can do all three missions for 1k, another gets 1 mission for 1k, another for 2k, and yet another gets two of them for 1k and the third for 4k! My level 110 paladin has finished broken shore, has her class mount, but does not get the elite strike force missions in the class hall. Is there a quest or achievement that is required before she can get them?